This comforting soup, another one of our riffs on a Mangoes and Curry Leaves recipe, is like a gingery cream of rice that you can eat for dinner. The first time we made it, we actually had to run a batch over to our friend Aryn, because it was too delicious not to share. In addition to being a good way to use up leftover rice, this dish is a really great thing to come home to after a day that was stressful, rainy or both. Put cooked rice in a blender with 3 cups water and 1 tablespoon salt and blend until broken down but not too smooth. Heat 1 tablespoon oil in a saucepan and add garlic, ginger, chile and shallots. Fry for only 2 minutes -- you want it to stay crispy. Pour in the rice mixture and coconut milk, add sweetener, and cook until heated through and totally delicious, 5 or so minutes. (If you are a banana-hater--hi Lauren!--you can stop here. But if you have even a glimmer of openness to bananas, please give it a try). Now for the exciting part: banana topping! Heat 1 tablespoon canola oil plus butter in a cast-iron skillet and gently add in bananas. 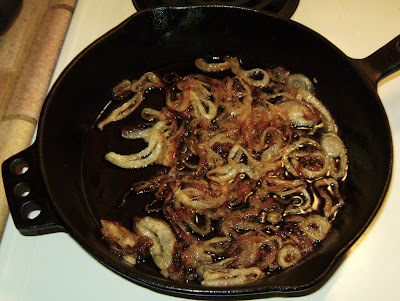 Cook on medium-high for 2-3 minutes on one side, then flip slices over and fry until well browned. The key here is not to stir--you don't want the bananas to turn to mush. Taste the soup and add more salt if you need it. Ladle into bowls and top with the bananas. Who doesn't love a pound of butter with a potato or two thrown in? Our only objection to potatoes Anna is that it takes so long to make. So this is our quicker and dirtier version: no potato soaking, no gentle blotting with towels, no painstaking scalloping. They still need an hour in the oven, but at least you didn't have to spend another hour on prep. Make sure to use a waxy boiling potato (as opposed to a floury Idaho baking potato). Wait, Did You Say 6 Tablespoons of Butter? Slice the potatoes very thinly, about 1/8 inch if you can (we don't have a mandoline, but if you do, this is why God created mandolines). Place the potatoes in a large bowl, melt the butter, and toss the potatoes with the butter to coat. 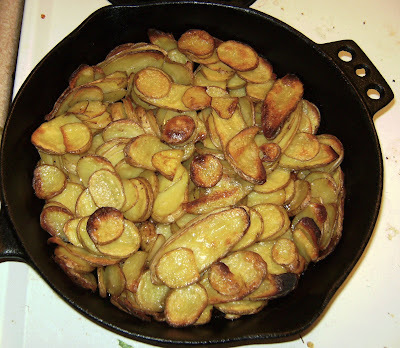 Grind in some black pepper and transfer the potatoes to a cast-iron skillet or heavy baking dish. Cover tightly with foil and bake on 375 for 30 minutes, then remove foil and bake for about 30 more minutes, until potatoes are browned and starting to crisp at the edges. Serving suggestion: We served these with steamed pea shoots. Phoebe usually eats her leftovers (if there are any) over brown rice with Andhra tomato paste, a spicy Indian condiment you can find in Indian groceries (East Bay folks, you can get yourself a jar at Bombay Spice House). If you're feeling adventurous or if you don't live in an Indian grocery Nirvana like Berkeley, try making your own. This was just going to be a potato-leek soup, but some surprise basil and celery leaves from my sister's garden ended up in the mix, yielding a smooth green potage with an unexpected flavor. The soup is deepened by making a stock from the trimmings while you work--and really, is there anything more satisfying than making stock out of vegetable trimmings before you throw them in the compost, having fully used them up? Cover trimmings (carrot top, green part of leeks, celery leaf stems, basil stems, and any other scraps you generate) with water in a medium-sized saucepan, bring to a boil, and simmer while you dice the white part of the leeks, the carrot and the potatoes. Heat the olive oil in a large stock pot. Add leeks and stir occasionally for about 5 minutes, then add in the carrot, potatoes, salt and paprika and stir over medium heat for about five minutes. Strain in enough stock to cover the vegetables, add the celery leaves and bring to a boil, then cover and simmer about 20-30 minutes, until potatoes are soft. When the potatoes are tender, turn off heat and transfer soup to a blender. Add the basil and celery leaves and blend until smooth, adding more stock if the soup is too thick. Season with pepper to taste, adjust salt if necessary, and finish with lemon juice. These tamales are a great addition to your Thanksgiving table--we made them last year with a cranberry salsa! The avocado-cilantro sauce used in this recipe is our attempt to recreate the avocado salsa that comes with tamales and taquitos at the Flacos stand at the Berkeley Farmers Market. This post is tagged "projects" not because you'll be preserving anything for the winter--you'll be lucky if you end up with leftovers--but because the recipe takes a long time, so make these on a day when you feel like puttering around at home. Prick the sweet potato and bake on 400 until soft. When you're finished with the prep steps, go ahead and start the masa. Put the butter or shortening in your food processor and pulse about a minute, until fluffy. Add baking powder, salt, 1 cup of the masa and 1/2 cup of water and process. 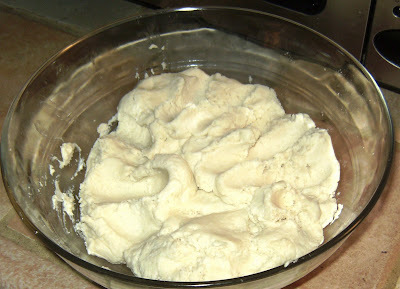 Keep adding cups of masa and half-cups of water until the mixture has a mashed potato-type consistency. Speaking of mashed potatoes: when the sweet potato is done baking, peel and transfer to a bowl. Mash well and mix in the caramelized onions. Taste the mixture and add salt if desired. Press the masa around the filling and seal. Take the resulting rectangular-ish chunk and lay on an opened corn husk. Fold edges of husk inwards, first vertically and then horizontally. Tie shut with string or a long strip of husk. Repeat until all masa is used up--this should make about 20 tamales. Get a large stock pot and fill with about an inch of water. Place tamales in a steamer basket in the stock pot and steam for about 40-45 minutes. When these are done, the masa should be steamed to a firm consistency. When tamales are almost done, place the avocado, cilantro, chile, lime juice, water and olive oil in the food processor and blend until you have a saucy consistency. Salt to taste. 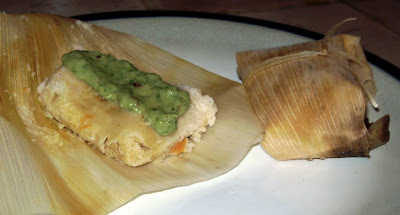 Eat tamales with a drizzle of avocado-cilantro sauce. First things first: no, we don't take a chip-and-dip bowl to the office. We made this for work snacks last month, forgot to take a picture, and then whipped up a batch as a games-and-mezze snack last night, hence the non-lunch-box presentation. But picture this in a work snacks container--doesn't that look like the answer to your 3 pm slump? 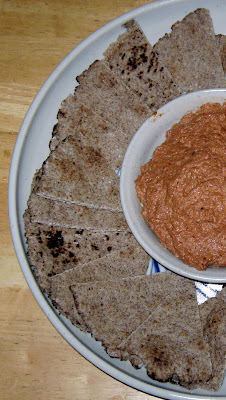 Muhammara is a red pepper and walnut spread, tart with pomegranate molasses. You can reduce or even omit the garlic and chile depending on whether you have the kind of job that involves breathing on other people--it's delicious no matter what, since the main flavors are the smokiness of the roasted peppers and the je ne sais quoi of the pomegranate molasses. Pomegranate molasses is available in well-stocked grocery stores (it's next to the honey at the Berkeley Bowl for you East Bay folks) or Middle Eastern food stores. Once you have some in your fridge, you'll drizzle it on everything; it's delicious over yogurt and granola. Also, no need to limit yourself to pita triangles--tortilla chips, zucchini rounds, carrot & celery sticks or crackers will work too. And if you're serving it at home, it's delicious with fried eggplant slices as an appetizer. Roast peppers in the broiler, turning until blackened on all sides. When peppers are completely blackened, remove from broiler and place in a paper bag to steam for about 15 minutes. When the peppers have cooled down, peel off the charred skins, discard cores and seeds and chop roughly. Throw the peppers and everything else in the food processor and pulverize for a minute or so, until you have a thick paste. If you want it thicker, add more walnuts; if you want it thinner, drizzle in extra olive oil. Bone-chilling rainy evenings have arrived in the Bay Area, and here's our latest defense. Dried Persian limes are a thrilling addition to your pantry and can be found in Middle Eastern grocery stores--they're hard as a rock, filled with delicious black pulp, and have a smokier and more complex flavor than fresh lime. Sure, you could buy the Numi Dry Desert Lime tea for an arm and a leg...or you could make this and let your DIY pride keep you warm at night. Hasn't Anyone Ever Heard of Central Heating? Position limes on a cutting board and smash with a jar or a hammer until they break open. And while you're smashing things, whack the cardamom pods so they open just a little. 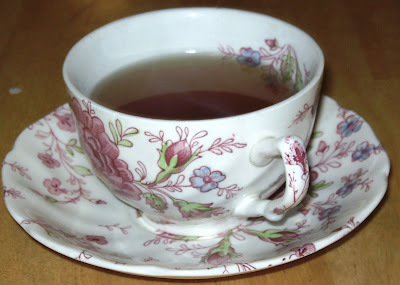 Place lime halves, ginger, cardamom and water in a medium-sized saucepan. Bring to a boil, then simmer gently for about 20-30 minutes, until tea is dark and deeply flavored. Strain, sweeten & drink. You may notice that this post is tagged "work snacks" and wonder what kind of barn I was raised in. I'll tell you: one in which my dad and my grandma made meltingly tender fried eggplant spiced with paprika and served it cold or at room temperature. This is actually a common thing for Syrian Jews to serve at room temperature for Saturday lunch, so why not have it for Tuesday snack in a little Tupperware? Of course, it's also delicious over cooked grains for dinner (we chose a red quinoa-brown rice mix), with lemon wedges to cut the grease. We've moved the paprika from the eggplant to a seat-of-the-pants dipping sauce we created with our abundance of roasted tomatoes, but if you're not into big canning projects, we provide alternate instructions for roasting tomatoes while you do other stuff. If you don't have roasted tomatoes, start here: roll the whole tomatoes in olive oil, sprinkle with salt, and bake on 300 for 1 and 1/2 to 2 hours. In a small bowl, pour boiling water over the chipotle and cover with a plate while you do everything else. 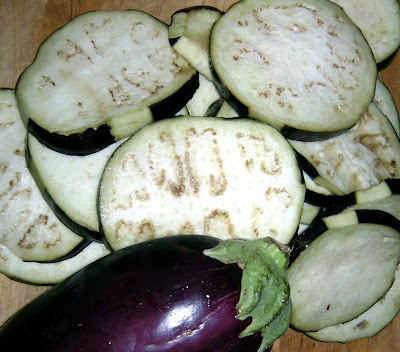 Place eggplant slices in a large bowl and sprinkle with salt. Let sit for about 30 minutes--the salt will leach out all the bitterness and it will collect in a brown pool at the bottom of the bowl (and to think you usually eat that!). Pat the eggplant slices dry, which will make them fry up nicely. Heat 2 inches of oil in a large frying pan. When a drop of water sizzles on contact with the oil, add the eggplant slices in a single layer (you'll need to do more than one batch). Fry for about 3 minutes, flip, and fry for 3 minutes on the other side. Remove finished slices to a paper-towel-lined plate. 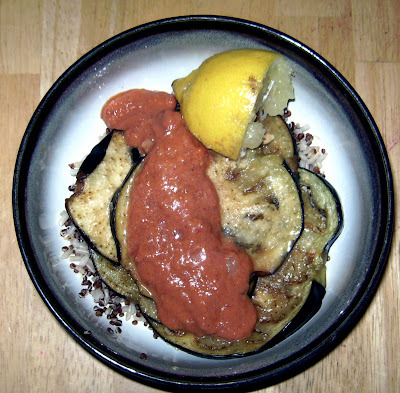 When all eggplant slices are fried, remove the stem and seeds from the chipotle and drop in the food processor with tomatoes (recently roasted or from your fridge), paprika and salt. Process until smooth. Drizzle sauce over eggplant and serve with a lemon wedge. This is our take on the cauliflower dum recipe in Mangoes and Curry Leaves, one of our favorite cookbooks. Dum is an Indian cooking technique where a pot is sealed with either dough (if you have time) or aluminum foil under the lid, which traps heat and deliciously steams whatever's inside. 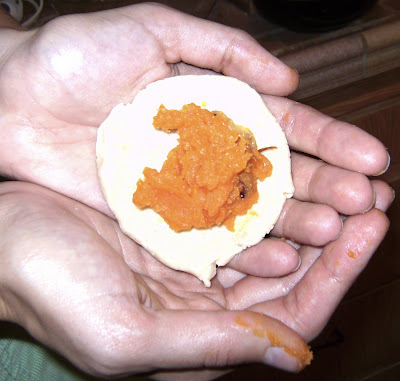 If you make a dough seal, you can dip pieces of baked dough into the dum! Conveniently for those of you who live in under-heated Bay Area apartments, this process will also essentially steam your house, so keep this in mind for chilly rainy-season weekends when you want to spend time at home without your teeth chattering. Heat the butter and oil together in a large wok over medium heat. Add in cauliflower and potatoes and cook, turning, until they are starting to brown. Remove with tongs to a large casserole dish with a tight-fitting lid. Without cleaning the wok, return to medium heat and add the onions, ginger and garlic. Saute 5-7 minutes, until onion is translucent. Shake in the cumin, stir for 30 seconds, and add in the curry leaves, tomatoes, garam masala, turmeric, salt and chiles. Cook for about 5 minutes, stirring. Add in the water, raise the heat, boil and simmer, uncovered, for about 10 minutes, stirring occasionally. Meanwhile, preheat oven to 350 and make the optional dough seal. In a large mixing bowl, combine the flour with just enough lukewarm water to make a moist dough--half a cup should do it. Generously oil your hands and knead briefly, then divide into two halves. On a floured surface, roll the halves into ropes. Together, they should be long enough to wrap around the rim of your casserole dish. 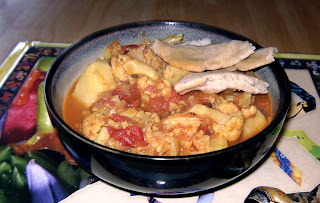 When tomato mixture has simmered for about 10 minutes (it should be fragrant and thickened), stir into the casserole dish with the cauliflower. Cover tightly with aluminum foil (if you didn't make dough) before putting the cover on. 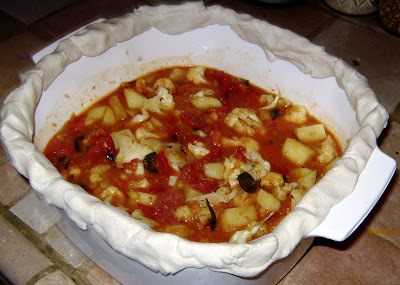 If you did make dough, gently press along the sides of the casserole dish and then cover with the lid. Bake for about 20 minutes. This will stay hot for a very long time if you don't break the (dough or aluminum foil) seal! 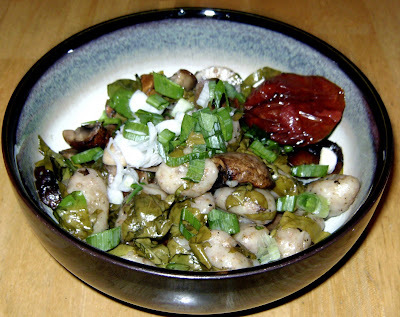 If you have access to sorrel (ours came from my sister's garden), it's a refreshing change from other greens--it does turn a pretty uninspiring shade of army green when cooked, but the lemony flavor is really surprising, and pairs nicely with richer tastes like roasted mushrooms. If you don't have access to sorrel, most cookbooks I've seen suggest substituting spinach with a little lemon juice. A few notes on this recipe: (1) we used whole wheat gnocchi, but you can use whatever cute chubby pasta you have around, like ziti or rotini, and (2) although this is delicious on its own, we topped it with a roasted tomato packed in olive oil, so if you made some, break open a jar (if you haven't made them, tomato season isn't quite over, and you'll thank yourself when you start throwing them in everything). Are You Sure I Can Eat It? Put pasta water on to boil in a large soup pot. 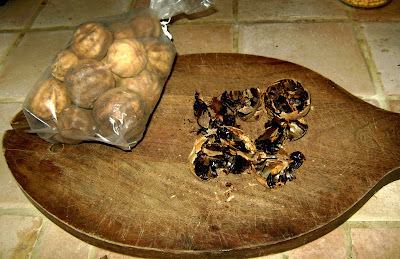 Meanwhile, dice mushrooms and toss in a large casserole dish with the olive oil, garlic, salt and pepper. Broil for about 15 minutes, or until mushrooms are brown and giving off liquid. By this time, the pasta water should be ready. Cook according to package directions, drain and return to the pot. Toss with 2 teaspoons olive oil and the mushrooms, then stir in the sorrel (when it's very finely sliced, like this chiffonade, it will steam on contact with the pasta, so you want to add it at the last minute). Top with scallions and a roasted tomato, if you have one.